When it comes managing and enhancing a customer's touchpoints with an organization, the impact of digital technologies is having a profound impact - not only on the customer experience, but also with the effectiveness of marketing to them. 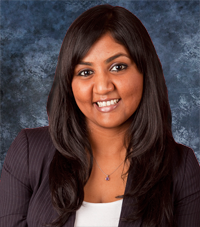 Reetika, How do you see this market evolving and what are the key drivers for marketing operations and digital customer experience management services? In the emerging As-A-Service Economy, HfS Research sees an increased convergence of the consumer-oriented business functions of marketing, sales and customer care to serve the end customer. Organizations will do this through enabling technologies and innovative service frameworks that create new opportunities for collaboration and redefine the omni-channel customer experience – from brand awareness and campaign personalization, lead nurturing and customer acquisition, service support through to long term engagement and retention. All of these areas of activity are focused on the customer experience, and in the digital world, instead of the marketing, sales, and customer care departments / functions dictating the experience for them to receive, the customers are increasingly participating as leaders, either consciously or unconsciously by their actions. It's compelling these departments to use data, analytics, and technology to work together in a new way and include and treat the end consumer more consistently across all the functions as well as channels. This trend is creating an exciting new consumer-focused services market. Currently, the solutions to these needs are being procured and sold disjointedly and opportunistically. Stakeholders are not aligned within client organizations. While the convergence is starting to take place particularly in the digital context, HfS still sees a siloed approach in services and technology procurement within and across these business functions – heads of customer service, heads of online sales, heads of analytics, CIOs, CMOs, etc. Clients have common pain points that service providers are trying to solve for in different ways – approaching from traditional strengths in ecommerce support and web development, data analytics, marketing campaign execution, or customer care. Providing services in overlapping or even adjacent areas is still very much a new concept, with few use cases today. Our Blueprint mapping illustrates highly innovative approaches but a long way to go in executing consistently. Our research found great examples of marketing and digital CEM innovation that service providers have been able to implement with willing clients already. However, we observed a marked absence of consistency in service providers bringing thought leadership and capabilities across their client bases. Creating more readily implementable use cases within the intersections of industry-specific context and the relevant enabling technology and services frameworks will drive the next few years of growth for this market. This also depends on buyers being willing to share best practices in order to also receive more value. The High Performers in this study – HCL, Genpact, Sutherland, Concentrix and Xerox – have diverse approaches to servicing this market. In the next few years, we expect their efforts to continue to expand the scope of the market: HCL with ecommerce integration, Xerox and Genpact with campaign execution strengths, and Sutherland and Concentrix continuing to push the envelope on technology enablement and the integration of digital into customer relationship management. Achieving greater scale through a more consistent approach to execution will help service providers in this market hit the top-right of our Blueprint matrix in subsequent studies. We expect to see this happen over the next year as the services mature. HfS Research believes that the marketing operations and digital CEM market will converge in a focus on helping client organizations respond to the new consumer truths that ‘digital’ is spearheading. These truths include the way consumers learn about, experience and discuss brands, respond to promotions and make purchase decisions, and interact and engage with them over their life times. Ultimately, this market will come together - and is already starting to with the anchor of ‘Digital’. Service providers are delivering the majority of services in the spectrum of marketing-sales-CEM in an isolated manner today, with practices that are for the most part distinct. However, we see market leading service providers beginning to tie these capabilities together and starting conversations with buyers using the ‘digital’ context, with some setting up Digital practices. Today these have more digital strategy consulting and technology infrastructure implications, but in the future will feature more rounded out services support functions (analytics-driven marketing, digital sales and CEM operations). The overlap between marketing, customer care, sales and ecommerce is not new but providing comprehensive services to the overlapping pieces and acting on the synergies is where the opportunity lies. 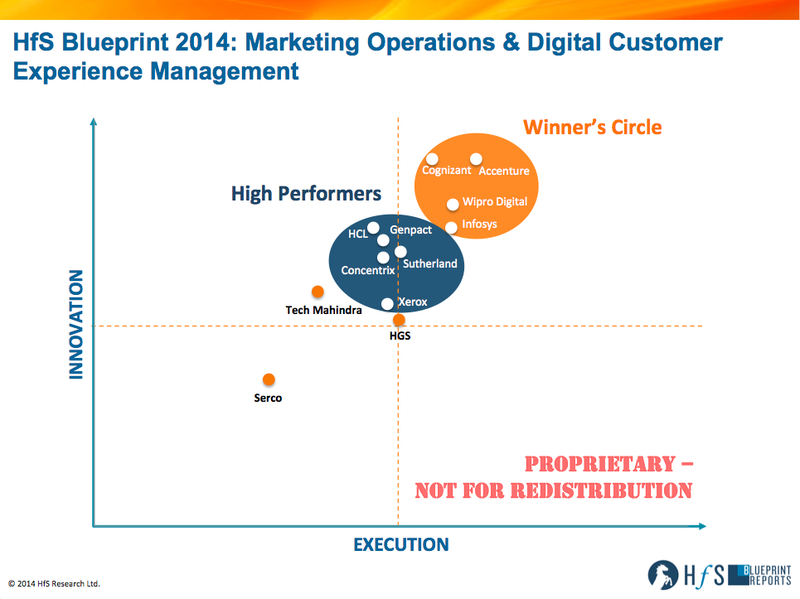 Buyers value flexibility in marketing operations delivery. Many buyers that worked with service providers on campaign management and marketing content management highlighted the importance of being flexible in day to day operations. This is an especially relevant attribute considering the complex nature of an organization’s marketing ecosystem, working across marketing departments, multiple ad agencies and creative production houses, distribution channel partners and technology partners, all across geographies and markets. Service providers that can institutionalize operational flexibility instead of rigid, standardized performance expectations from their staff will find greater success in maneuvering their clients’ challenging marketing environments. Talent plays a critical role in driving marketing success for clients. HfS noticed the emphasis on getting the right talent for marketing operations and analytics support among buyers across the board. Several clients attributed engagement to having the right talent in place, and the steps taken by their service providers towards hiring, developing and retaining. Buyers are increasingly looking for talent that come with marketing experience within their specific industries that can work alongside their marketing teams without missing a beat on, for example, campaign execution. Similarly, analytics talent that can pull together learning across industries to bring new ideas are highly valued, particularly for omni-channel customer analytics. Some service providers will thus have to rethink their typical hiring strategies to seek specialized talent that are seemingly making or breaking these marketing engagements. Customer experience management is still very much an emerging area in the digital context. HfS sees CEM as a recasting of the old CRM BPO and enabling technologies, creating new market opportunities. Buyers are acutely aware of the challenges they face ahead of them in formulating and executing on their digital strategies. They expect service providers to particularly help them contend with the pace of change in the ways that end customers are creating and experiencing brands in an omni-channel environment today. Opportunities in this space include addressing changing customer channel preferences, digital marketing optimization, ecommerce and brick-and-mortar integration, particularly in CPG, retail, travel and hospitality, consumer electronics, retail banking and pharma. Reetika, thanks for taking the time to share your new research. We look forward to more of your continued coverage of consumer-led operations services in the coming months. HfS readers can click here to view highlights of all our recent 18 HfS Blueprint reports.